The term stabilized base, presented in this section, refers to a class of paving materials that are mixtures of one or more sources of aggregate and cementitious material(s) blended with a sufficient amount of water, that result in a mixture having a moist, nonplastic consistency that can be compacted to form a dense mass and gain strength. This class of base or subbase materials is not meant to include the stabilization of soils or aggregates using asphalt cement or emulsified asphalt. Soil-cement (or cement-treated base) is probably the earliest example of a stabilized base material. Roller-compacted concrete, which is similar to, but more granular than soil-cement, is another type of stabilized base product. Probably the most frequently used type of stabilized base materials are the basic lime (and/or cement)-fly ash-aggregate family of mixtures, which can use many different combinations of reagents(s) and aggregate(s) together with coal fly ash. Calcium chloride has also been used to a lesser degree in some of the warmer regions of the country for mechanical stabilization of dense-graded aggregate base courses. The purpose of a stabilized base or subbase layer is to provide a transitional load-bearing strata between the pavement layer, which directly receives the wheel loadings of vehicular traffic, and the underlying subgrade soil. Stabilized base or subbase materials may be used to provide support for either flexible or rigid pavements, but are more frequently used with flexible pavements. Stabilized base or subbase materials are either mixed in place at the job site, or are mechanically combined in a mixing plant and transported to the site. These materials are spread evenly in loose layers on a prepared subgrade or subbase using either a blade-grader bulldozer, spreader box, or paving machine. Once the material has been spread, it is then densified by means of conventional rollers of compaction equipment. The components of a stabilized base or subbase mixture include aggregate, cementitious materials, and water. Aggregates comprise the major portion of stabilized base. Normally, between 80 to 95 percent by weight of a stabilized base or subbase mix may consist of aggregates. A wide range of different types and gradations of aggregates have been used in stabilized base and subbase mixtures. 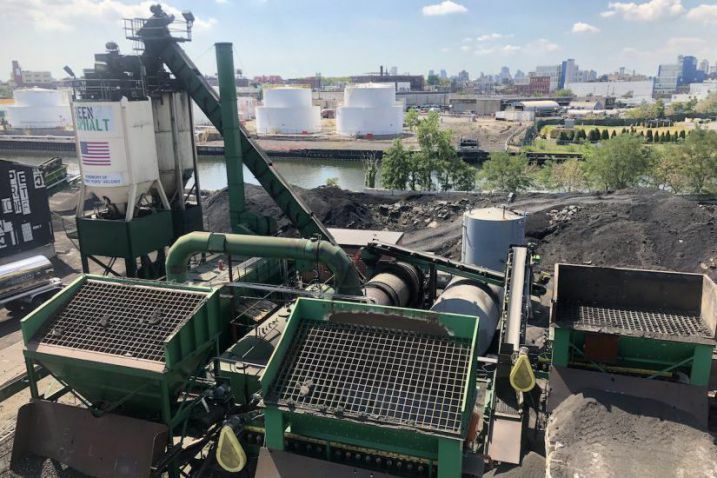 These include conventional aggregate sources, such as crushed stone or sand and gravel, and other aggregate materials, such as blast furnace slag, recycled paving materials, and bottom ash or boiler slag from coal-fired power plants. Reclaimed pavement materials have also been successfully recycled into stabilized base and subbase mixtures, as have some marginal aggregates. Aggregates used should have the proper particle size, shape, gradation, and particle strength to contribute to a mechanically stable mixture. The key to strength development in stabilized base or subbase mixtures is in the matrix that binds the aggregate particles together. The strength of the matrix is affected by the cementitious material used in the mixture. The amount of cementitious material in a stabilized base or subbase mix usually ranges from 5 to 10 percent by weight of the mix, but may in some cases comprise as much as up to 20 percent by weight if a lighter weight aggregate is used. In some parts of the United States, mainly west of the Mississippi River, fly ash from the burning of sub-bituminous coal is widely available and, because it exhibits self-cementing characteristics when mixed with water, it can be used by itself with no other cementitious material to bind aggregate particles together. Coal fly ash, produced during the combustion of bituminous coal, is frequently used in stabilized base mixtures. Since this type of fly ash is a pozzolan, the mixtures in which it is used are often referred to as pozzolanic stabilized base (PSB) mixtures. Pozzolans are materials composed of amorphous siliceous or siliceous and aluminous material in a finely divided (powdery) form (similar in size to Portland cement particles) that will, in the presence of water, react with an activator to form compounds possessing cementitious properties. Pozzolan activators are alkaline materials that contain calcium and magnesium compounds present in sufficient amounts to chemically react in the presence of water with the silicate and aluminates in the pozzolan. Descriptions of various kinds of pozzolans and their specifications are provided in ASTM C618. In PSB compositions, the fly ash is usually used in combination with either lime, Portland cement, or kiln dust, plus water, to form the matrix that cements the aggregate particles together. When used with a chemical reagent, this type of fly ash normally comprises between 10 and 20 percent by weight of a stabilized base or subbase mix. When used with lighter weight aggregates (such as coal bottom ash), the percentage of fly ash may be as high as 30 percent or more. Aggregates used in stabilized base and subbase mixtures play a major role in determining the quality and performance of stabilized base and subbase mixtures. 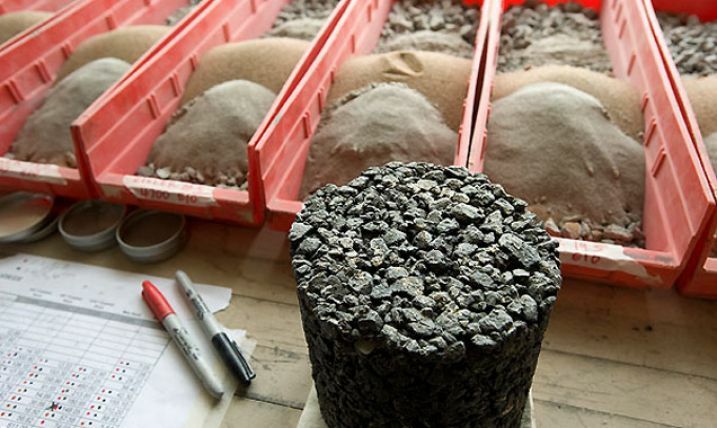 Aggregate materials used in these types of mixtures must be properly graded and possess good to adequate particle shape, strength, and integrity. AASHTO, in conjunction with the Association of General Contractors (AGC) and the American Road and Transportation Builders Association (ARTBA), has published a Guide Specification for Pozzolanic Stabilized Mixture (PSM) Base Course or Subbase (see reference section). This guide specification recommends quality requirements for aggregates. Gradation - a wide range of aggregate sizes and gradations have been used in stabilized base and subbase mixtures. A number of different aggregate gradations may be considered, provided mixture design data for strength and durability can be furnished that indicates that such mixtures are capable of satisfying applicable strength and durability criteria. To maximize mix density, minimize void spaces, and not compromise the durability of the stabilized base mix, it has been recommended by the Portland Cement Association (PCA) and others that at least 55 percent of the aggregate used be finer than 4.75 mm (No. 4 sieve). Abrasion Resistance - aggregate particles in stabilized base and subbase mixtures must possess sufficient particle strength to resist degradation and breakdown during construction and under repeated traffic loadings. Durability - aggregates used in stabilized bases and subbases must be sound and durable and able to meet the soundness quality requirements. Unit Weight - the unit weight of the aggregate used in stabilized base and subbase mixtures is an indicator of the compacted density of the mix containing this aggregate. Deleterious Substances - aggregates used in stabilized base and subbase mixtures should be reasonably free of deleterious substances, such as clay, shale, coal, coke, vegetation, or other debris. Plasticity - the fraction of the aggregate that passes the No. 40 sieve should have a liquid limit no greater than 25 and a plasticity index less than 4 (essentially nonplastic). Standard test methods typically used to assess the suitability of conventional aggregate materials for use in stabilized base and subbase applications are listed in Table 10. Fineness - the fineness of the cement or supplementary cementitious materials affects heat release and rate of hydration. Finer materials react faster, with a corresponding increase in early strength development. Fineness also influences workability, since the finer the material, the greater the surface area and frictional resistance of the plastic mixture. Setting Time - the setting time for the cement paste is an indication of the rate at which hydration reactions are occurring and strength is developing. Compressive Strength - compressive strength is influenced by cement composition and fineness. Compressive strengths for different cements or cement blends are established by compressive strength testing of mortar cubes. Specific Gravity - specific gravity is not an indication of the quality of the cement, but is required for concrete mix design calculations. Table 11 provides a list of standard laboratory tests that are presently used to evaluate the mix design or expected performance of cementitious materials for use in stabilized base mixtures. Fineness - the fly ash particles must be fine enough to provide sufficient surface area and for reaction with Portland cement or other activators (such as lime, lime kiln dust, or cement kiln dust) and to enhance the flowability of the flowable fill mix. Pozzolanic Activity - pozzolanic fly ash must be composed of a sufficient amount of silica and alumina to react chemically with available calcium to form cementitious compounds, while self-cementing fly ash must contain sufficient calcium and magnesium silicate and aluminates to develop strength in the presence of water. Table 11. Cementitious materials test procedures. Table 12 lists applicable test methods that contain criteria for evaluating the suitability of fly ash for use in stabilized base and subbase mixtures. Table 12. Pozzolan test procedures. Compressive Strength - this refers to the ability of a well-compacted stabilized base mixture to develop a specified minimum level of unconfined compressive strength under specified curing conditions. Durability - this refers to the ability of a well-compacted stabilized base mixture to resist the deteriorating effects of cyclic freezing and thawing, and/or wetting and drying, once the material has achieved its design strength. Maximum Dry Density - the maximum density or compacted unit weight of a stabilized base mixture that has been compacted at or very close to optimum moisture content using prescribed laboratory compaction procedures. Optimum Moisture - the moisture content at which the maximum dry density of a stabilized base mixture is achieved in the laboratory using prescribed compaction procedures. Compacted Density - the actual in-place density of a stabilized base material that has been compacted in the field according to project specifications. Volumetric Stability - this refers to the ability of a well-compacted stabilized base material to maintain its volumetric dimensions and resist potentially expansive chemical reactions after placement and compaction. Resilient Modulus - this property defines the relationship between repeated axial stress applied to a base or subbase material and the deformation response of the material and can be used in multi layered pavement design. Table 24-13 provides a list of standard laboratory test methods that are used to evaluate the mix design properties and/or performance characteristics of stabilized base or subbase mixtures. Table 13. Stabilized base and subbase material test procedures. AASHTO/AGC/ARTBA Guide Specification for Pozzolanic Stabilized Mixture (PSM) Base Course or Subbase. American Association of State Highway and Transportation Officials, Washington, DC, 1988. Lime Stabilization Construction Manual. National Lime Association, Arlington, Virginia, 1980. Materials for Stabilization. American Road and Transportation Builders Association, Washington, DC, 1977. Soil-Cement Construction Handbook. Portland Cement Association, Skokie, Illinois, 1995. Soil Stabilization in Pavement Structures. A User’s Manual. Volumes 1 and 2. Federal Highway Administration, Report No. FHWA-IP-80-2, Washington, DC, 1980. Stabilization and Pavement Recycling. American Road and Transportation Builders Association, Washington, DC, 1979.